Thanks for choosing our office for your dental care! We’re excited to welcome you, as we begin building a lifetime of beautiful smiles for you and your family. Each and every member of our dedicated team is here for you. From the friendly faces at the front desk who greet you when you enter, to the assistants and hygienists who make your smile sparkle, we’re committed to transforming your idea of dentistry into a fun, engaging experience. Yes, you can enjoy a visit to the dentist, and we’re ready to prove it. We’re sure you’ll leave with a smile. Whether it’s your first visit or your 100th visit, you’ll always feel welcome. From the moment you step into our office, it’s our goal to provide excellent dental care in a warm and comfortable environment. First, we’ll review your new patient forms and answer any questions you may have initially. Dr. Jennine Huet will provide a comprehensive exam, complete with oral cancer screenings and x-rays. From there, you’ll work closely with Dr. Huet to determine an individual treatment plan that addresses all your issues and concerns. If your exam shows healthy gum tissue, one of our skilled hygienists will perform a cleaning. If there are signs of periodontal infection, we will reschedule you for a professional deep cleaning with anesthesia and discuss your hygiene habits. You’ll leave with a whole new outlook on your smile and actually look forward to your next visit. Visit our online Patient Portal to print all your New Patient paperwork and save time at your first visit. Fill out the forms in the comfort of your own home at your convenience, and just bring them with you to your first appointment. You probably don’t think of a visit to the dentist as the most relaxing thing you’ll do all day. 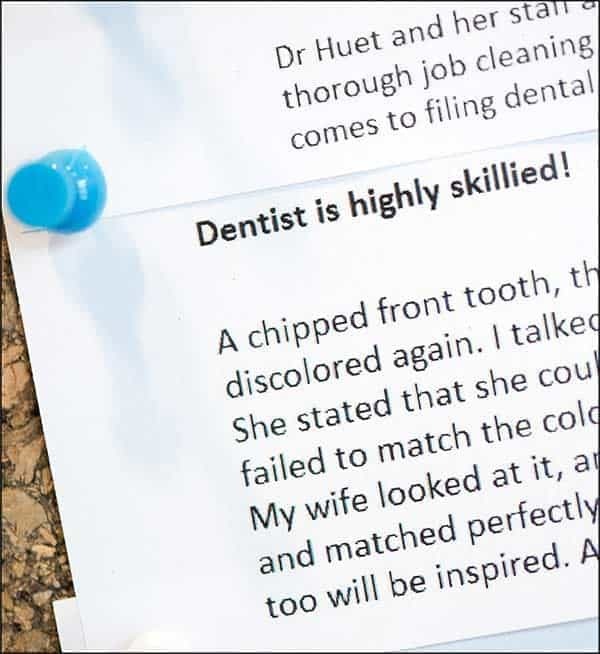 Well, that’s because you haven’t been to Huet Dental. Whatever you need to enjoy your visit and feel at home, we’ll do our best to provide. Don’t hesitate to ask any member of our team because we are always here for you. Out-of-network? Don’t worry! We’ll take the assignment of benefit (the amount your insurance company will cover) and all you have to pay is the estimated balance at the time of your visit. We also offer third-party financing through CareCredit , and accept all major credit cards. Get the dental care you deserve. Our financial coordinator is here to help you determine the best way to pay for your treatment.